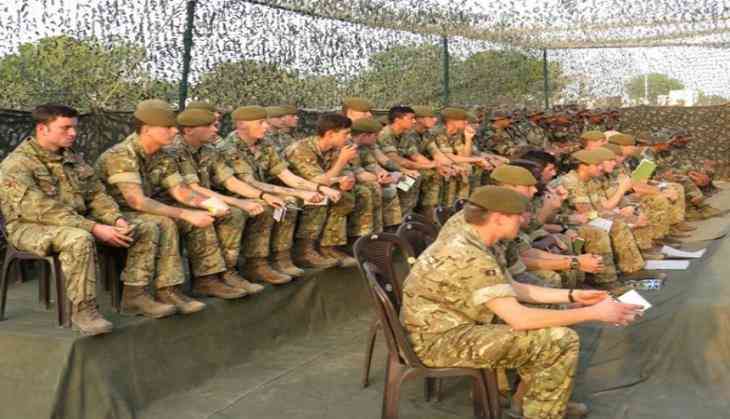 The Indo-UK joint military exercise 'Ajeya Warrior 2017' is heading to a close as the two-week long training session ends on 14 December. The third edition of the exercise began on December 1 at Mahajan field firing ranges in Rajasthan's Bikaner. The 14-day exercise included the round of physical training and yoga, followed by the demonstration on explosive detection by the use of trained dogs by Indian Army. Towards its end, the training session seamlessly slipped into setting the stage for a grueling continuous 48 hours long joint validation exercise which will test the troops and will culminate tomorrow with the termination of the exercise. The exercise will end tomorrow with a befitting closing ceremony which is expected to be attended by senior officials and observers of the two countries. Set in the backdrop of counter terrorism, the exercise afforded opportunity to the two countries to share and learn from each other's experience in handling terrorism.